We did it! We publicly transited! 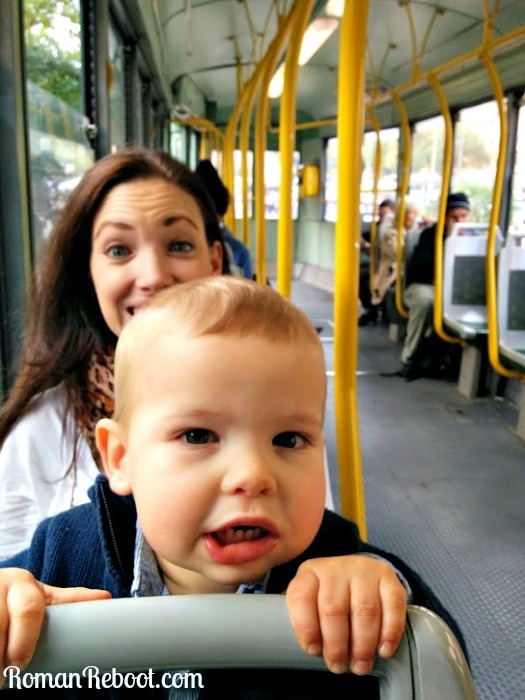 I actually have two tram trips under my belt now, but this is a post about our first. (No bus or metro yet.) 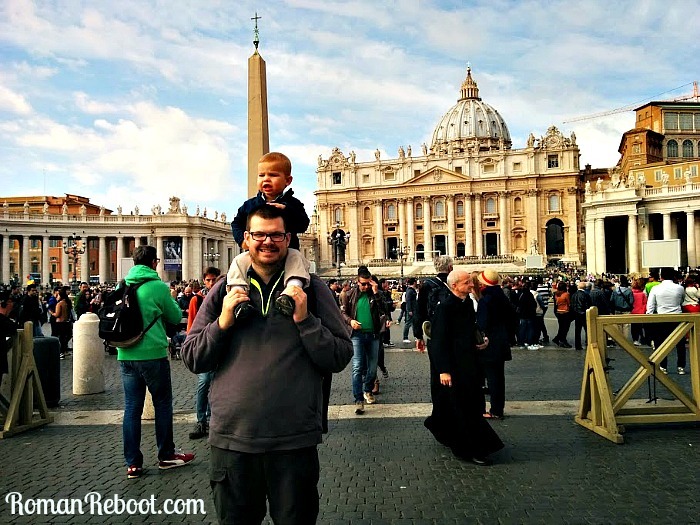 After we purchased our tickets, I went with a “go big or go home” approach and suggested to James that we go to church. At St. Peter’s. After consulting the tram schedule, this was not as crazy as it originally sounded. We could pick up a tram a few blocks from our house that would take us right there. After much less cajoling than expected, James was convinced. Now, I know what you’re thinking. 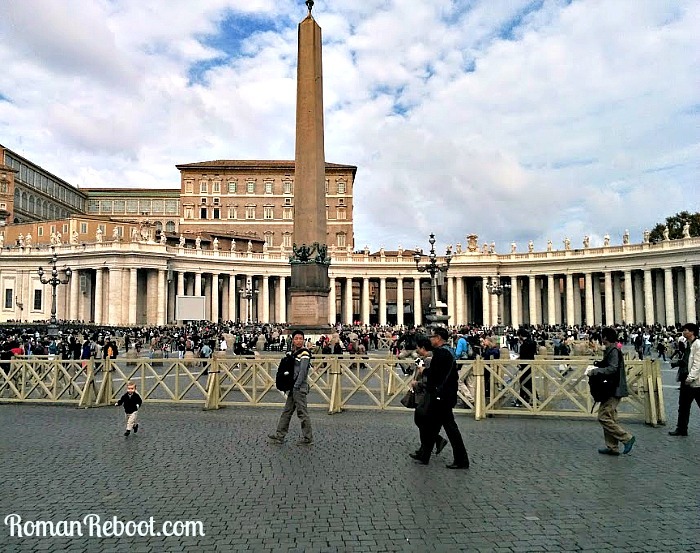 Hey, lady with the two small kids – you know St. Peter’s is pretty crowded, right? ESPECIALLY on a Sunday. And that is fair. Being a Sunday morning did actually help us on the public transit front though. Fewer cars on the road meant our travel time was faster. It definitely cut against us because I forgot it was the last Sunday of the month, which means museums are free and therefore crowded. We decided to go for it, taking the attitude that it’s not that far away. If we want to see more, we’ll go back. After consulting mass times, we decided to aim for the 10:30 am. The tram rolled up after waiting just a few minutes. The tram wasn’t packed, but people were leaping out of their seats to make room for the kiddos. (This happened again the next day.) This was nice and comforting for when I venture out with the kids on my own. In DC I could usually get a seat, but not always, and people weren’t falling over themselves to make room. Once we got there, we remembered about the free-museums-last-Sunday, but we weren’t trying to go into the museum–just St. Peter’s. So we set off for the Square. How bad could it be? It was pretty packed. The line snaked all the way around the square. I decided to wait in it for a bit. It was a gorgeous day. James got to chase Henry around. He said Henry got a lot of “aww” looks and some “who does this child belong to” looks. At one point I saw a woman go up to Henry, but I figured James is right there, everything must be fine. Apparently, she came up and said Henry was so beautiful she wanted to kiss him. And then actually kissed him. The line took about 35 minutes. We went through metal detectors. We made it! Inside, it was very packed. We were about ten minutes late to mass, but that’s practically on time around here. 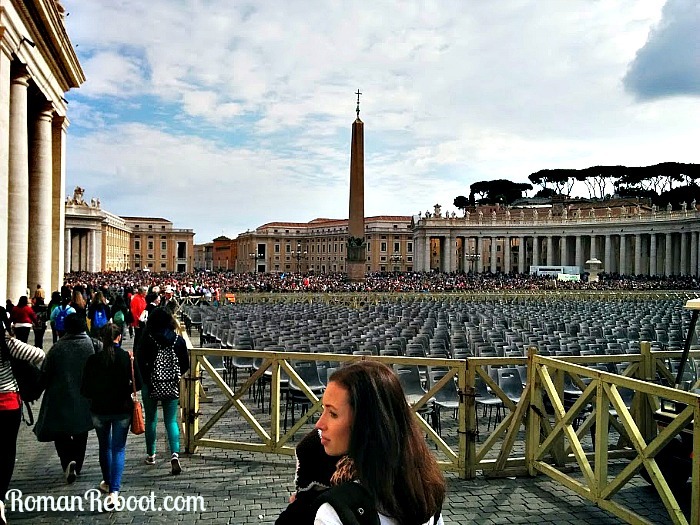 A few minutes after we arrived, however, they started announcing communion instructions. “Either that is the fasted mass ever or we messed up the times,” I told James. It seems we messed up the times. We were roped off from the legit worshipers who were more in the know on mass schedules, but we decided to look around where we could. At this point, we could probably leave and get home in time for lunch and actual naps without any serious meltdowns. But James realized the Pope would be addressing the crowd at noon. That meant if we could make it another half hour, we could be a part of that crowd. They were no longer letting people into the church, and we realized that the exit point was a pretty great spot to see, should we want to wait. The weather was on our side. Should we go for it? I looked at the gathering crowd. Hundreds. Thousands. I’m bad at estimating, but it was a lot of people. After dithering for a few more minutes, I decided that waiting half an hour could be tolerable, but exiting when everyone else was would not be. So we bailed. Instead of calling the trip a failure, I’m calling it a win. We successfully navigated public transportation. 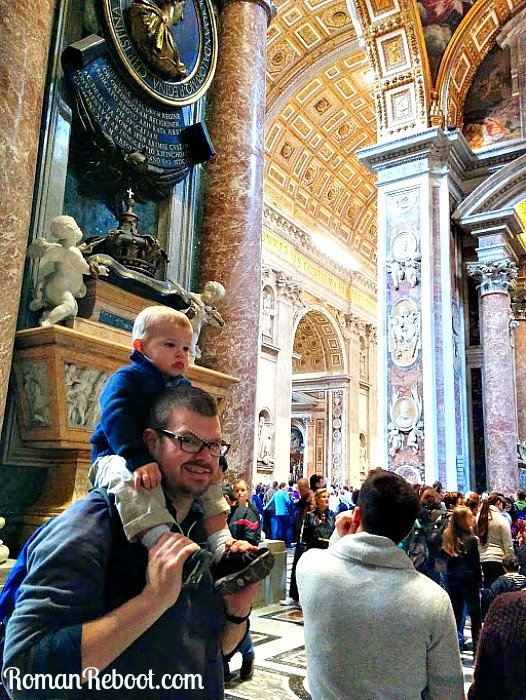 Even if we didn’t mass, we got to see inside St. Peter’s. 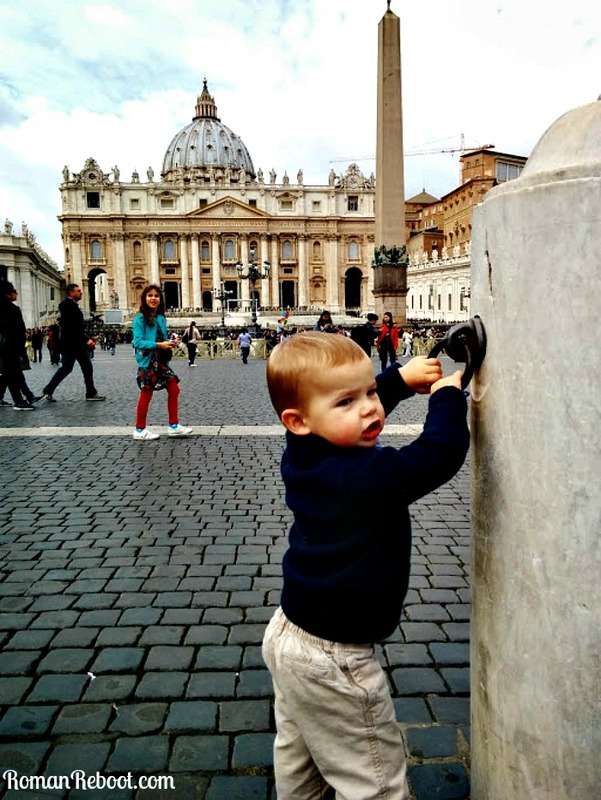 Even if we didn’t see the Pope, we know a good strategy for viewing next time. And that’s the beauty of living here. We can come back whenever we want. 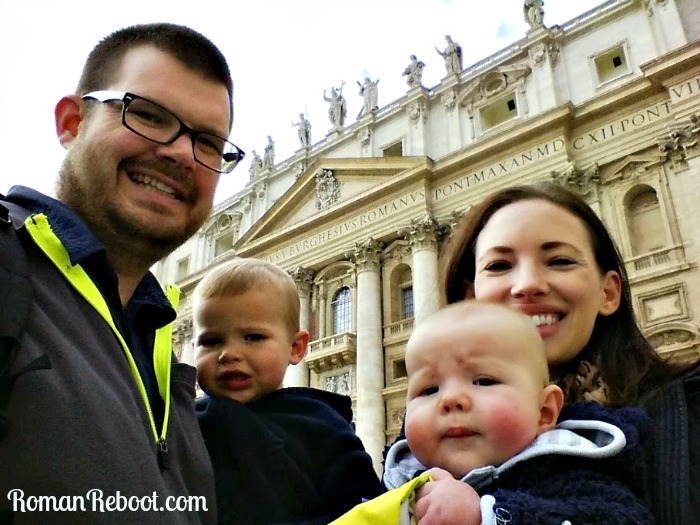 I’ve talked to Henry some about that time he went to the biggest church in the whole world. 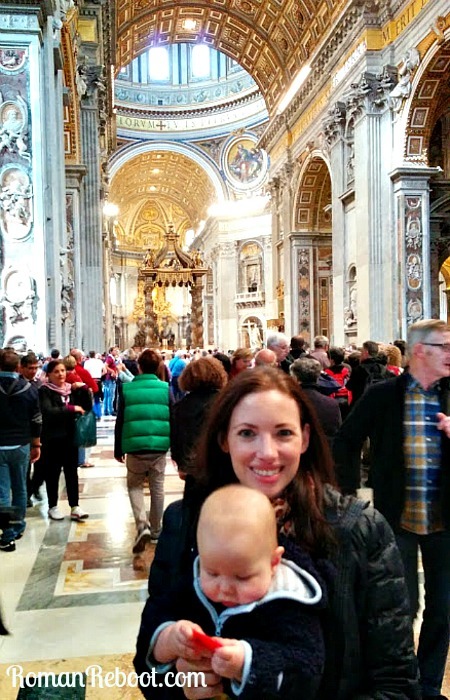 “You know, St. Peter’s.” Henry is all, “Mr. MacGregor’s garden.” What, kid? Oh, right, Peter Rabbit. Different Peter, but at least something is rubbing off.